I was attempting to tidy up the burgeoning pile of odds and ends generated by regular sewing. Thread doesn’t always get used up, I change my mind about design features and abandon bits and pieces along the way. In short it was high time to create a nice quick project to use up some of the above. 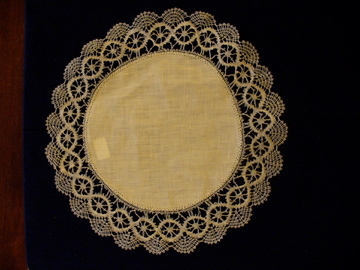 Inspiration: coming across some embroidery given by a friend, whose mother had passed away many years ago. She’d given me what was left of the sewing odds and ends she had found. The unfinished pieces are going to be used as samples (of course clearly identifying they are NOT from my hands!) but the finished/nearly finished work was too good for just samples. 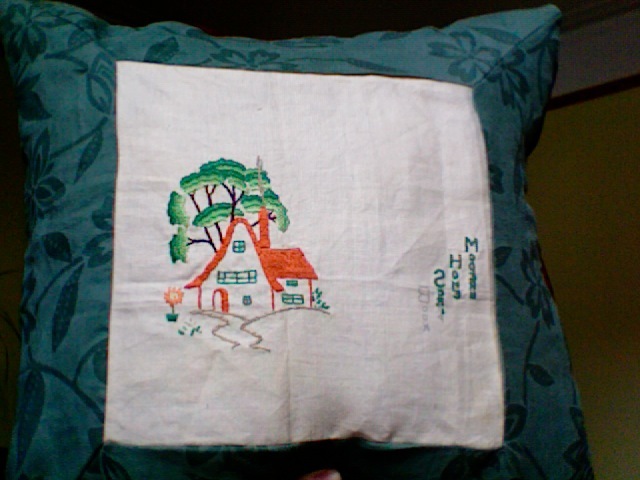 I had also been aware the cushion I had bought at my mother’s request (but didnt need any more) which I had never got round to getting a refund for was also in of “liberating”. 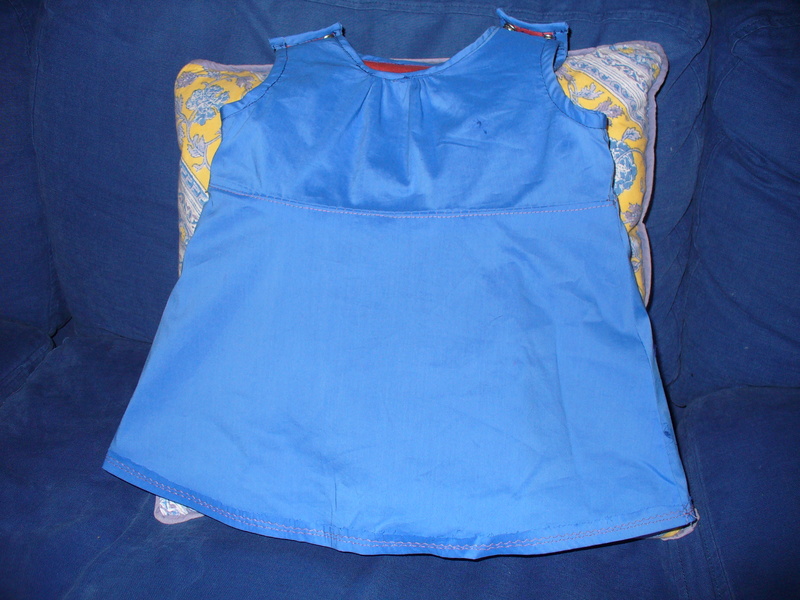 So, the two stories came together, with the help of the fabric leftover from two fabric hogging dresses. 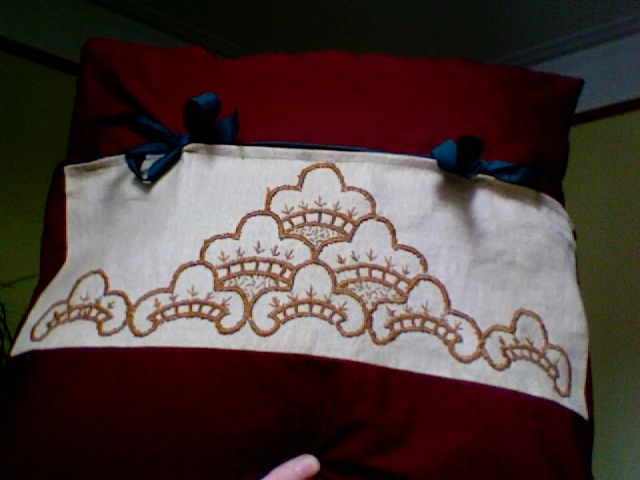 The resulting cushion cover was pretty easy to make. Had I not gone for linen on one side it would have been even easier. Unfortunately I had neglected to consider quite how much the linen would stretch. If you look carefully on the red side you will see its slightly lopsided as a result. 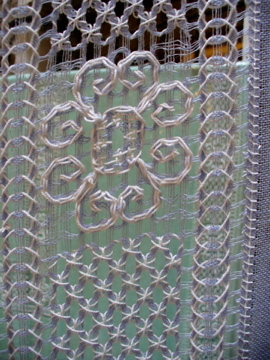 But, the great thing is with this kind of thing its not as critical as when is wearing the resulting project. I’m pleased to say I’ve reduced my stash in terms of thread and bias tape (didnt buy ANYTHING new for this), reused some fabric and recycled some embroidery in to a new object. This is going to be given back to the friend who gave the embroidery as a house warming present (she’s doing up her home) and it seems only fitting she gets to enjoy the hard work put in to the embroidery. the front, if you look carefully you can read “modern house” Suited to house warming present, no? So my sewing and course buddy tells me the oh so wonderful news that apart from the fact I need to do yet ANOTHER sample of embroidery above and beyond my bewitch in stitch version I have to do yet MORE. Bear in mind I had already started the laborious process of sketching out a full and detailed rose, and had been carefully backstitching my way round the outline before embarking on filling stitches. Our good tutor had neglected to mention that we also need to do a sample of unconventional (i.e. 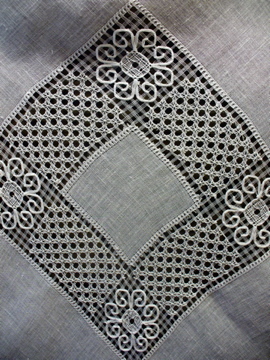 no thread or beads) embroidery. Oh joy. In case you had not picked up on the severe sarcasm so far, of all the samples so far, this has been my least favourite. So, I wracked my little overtired brain (this is the end of a long week) for inspiration. Non conventional “fabric” options. Hmmm. How about plastic paper sleeve? I’m waffling on at my housemate about me being stuck for ideas. She suggests yet further plastic for “thread” i.e. strips of plastic carrier bags. I am officially started! so, I have made three things. A plastic flower (as the sample is supposed to be connected to my New Look/Dior theme), herringbone stitching which looks remarkably like the back of a corset (tick!) and of course a dress, as that’s what it was all about. 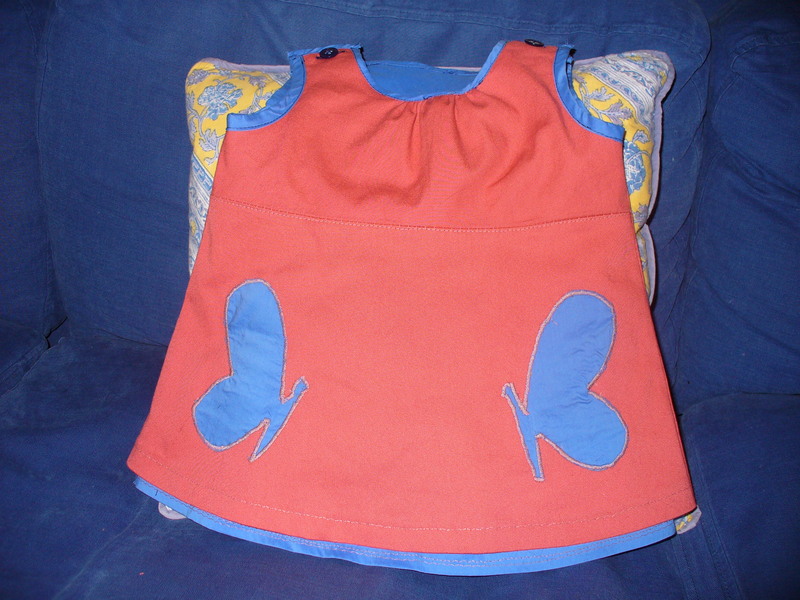 Unlike conventional embroidery this was a LOT easier to make. Get a good hole punch, and away you go. Accuracy is not quite so critical either. 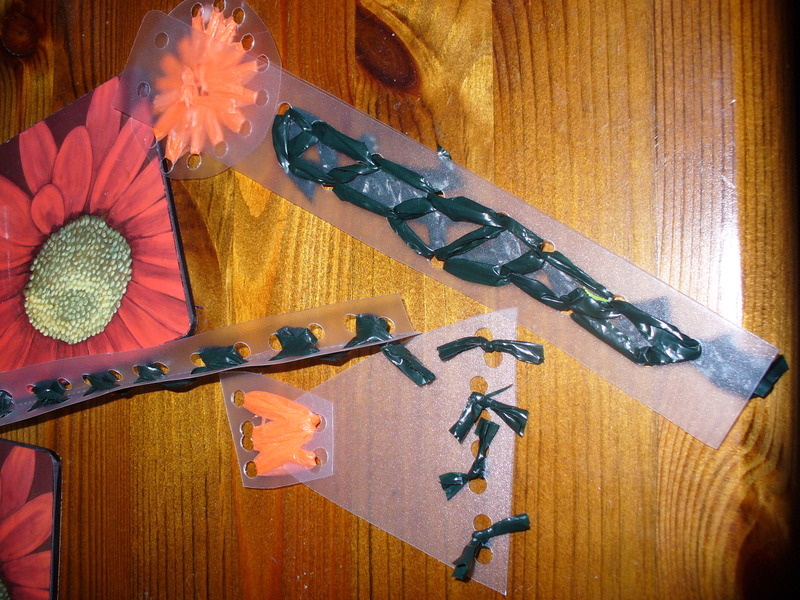 Hooray, I might actually survive this sampling unit after all… I think my favourite is the flower with a leaf. FBA – feeling bit anxious! I venture in to new territory – the full bust adjustment. I’m having to adjust my tired brain tonight, as it struggles to get the little brain cells wrapped round the process of figuring this out. No, I have not suddenly changed size, this is a project for someone else! I’m hoping some readers might be able to advise if the following modified pattern piece looks right, or if I need to try again. It’s a size 14, and needs to fit 38 inches (final measurements of the size 14 are 38 1/2, so will need to add at least two more for ease). This year quite a few friends haven’t had good news. It’s hard standing by the sidelines knowing there isn’t all that much you can do to help out (apart from listen). This creation is for one good friend who’s had some difficult weeks, and her little one. It’s more for the summer than now, but it’s been a lot of fun to make. . The fabric used is from what I had leftover after making a shirt, and some toile fabric where I thought I could use up what’s left over from a bigger project. It’s been lovely not having to worry about fit, so I’ve been able to concentrate on fun details like adding a lining and using decorative stitching. There was one further unexpected addition to my last hours finishing this dress. 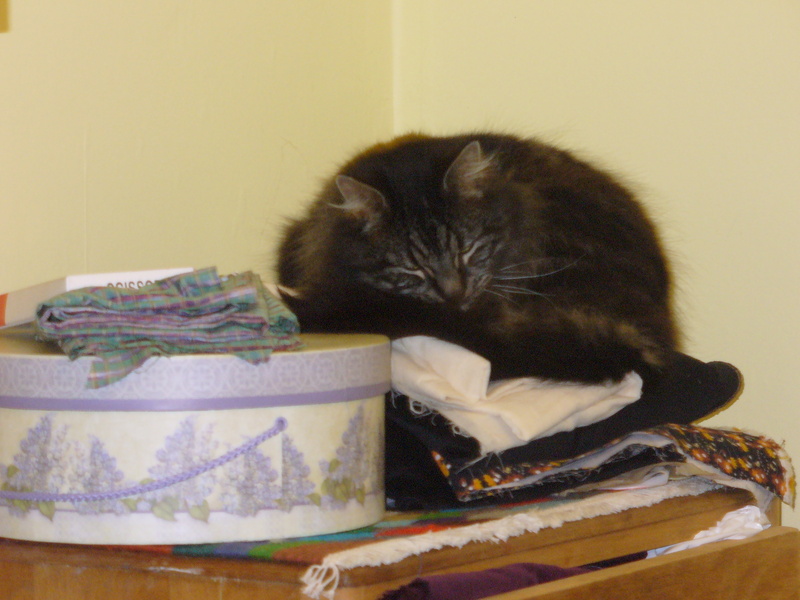 The next door neighbour’s cat made a beeline for my fabric stash and settled down to a very contented snooze. Nice to know I have such a dress making appreciative feline nearby! I’ve just come back from a trip to Venice. This has not (nor will it be!) a travel blog. 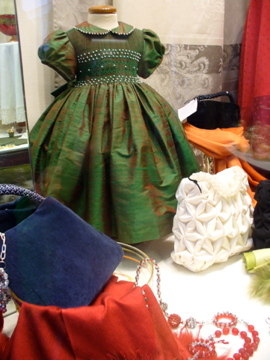 But, Venice has a lot of things which will appeal to the fashion connoisseur/dressmaker. So, I’d like to share a glimpse of some of the best (fabric related) bits. I dont (and have no intention of) smock. But I have to say this example is really pretty. ooh la la! its La Perla! So, a brief explanation of what you are looking at. 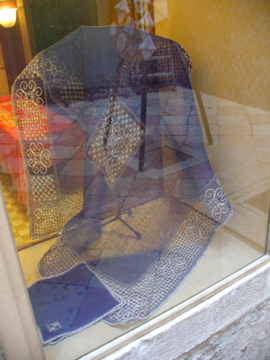 According to my guide book hand made lace is a (dying) speciality of Venice so I hot footed it (literally, feet were killing me from all the walking) to this recommended shop. 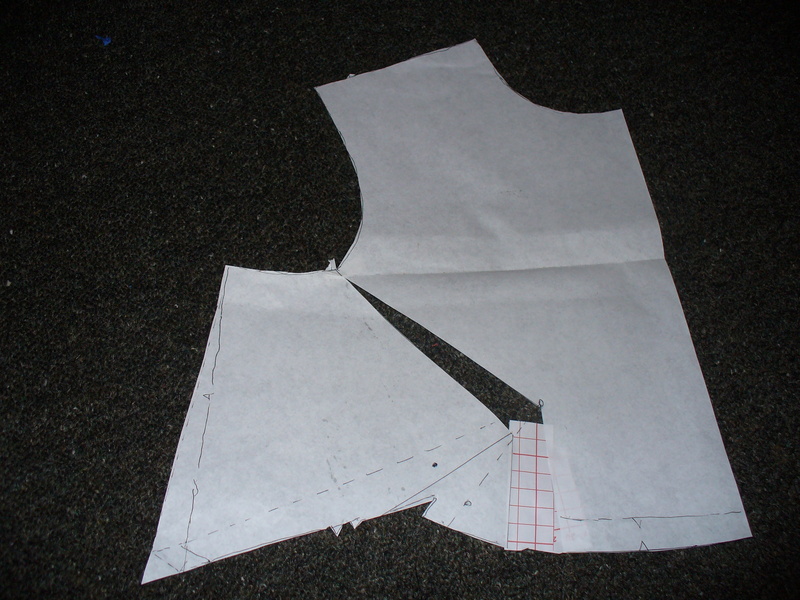 I had hoped to buy some small pieces to incorporate in my dressmaking projects. Alas, all were completed articles and I could not bring myself to contemplate cutting them up. It would be disrespectful to all the hours of work. But, I still could admire, which as you can I see I certainly did. 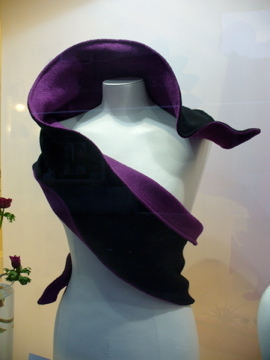 There were several very high end fashion shops, the likes of which are not available near where I live. I loved looking at the window displays. 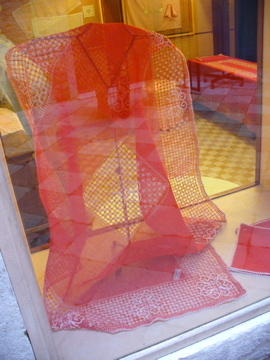 As you can see La Perla has some very detailed lace work (modern interpretation of historical pieces, who knows?) and there were some lovely examples of work with wool too. For those interested in more detailed snippets, please visit my coursework notes page where I will be posting more photos as I intend to use my visit to help add some examples to my coursework notes.